Our 2016 two night Mystery Tour to the Hamptons was a huge hit, so we are offering this tour in 2018. At just 100 miles long and 20 miles wide the island is diverse in its variety of offerings. Explore quaint harbor side villages, drive through Mansion Row and Southhampton Village, tour of the Montauk Point Lighthouse plus much more. Check into the four star Hotel Indigo East End in Riverhead where you will enjoy your accommodations for the next two nights. Dinner will be served at the hotel, the meal will be served poolside, weather permitting. 7:30 am Enjoy a full American buffet breakfast at the hotel. Arrive in the pristine village of Southampton. Your guide will take you on an informative tour that will include such sights as historical homes, museums, Main Street, churches and mansions. You will have the opportunity to see some of the most elaborate homes in America owned by some of the world’s wealthiest people. Many of these homes line the magnificent shores of the South Fork overlooking the majestic Atlantic Ocean. 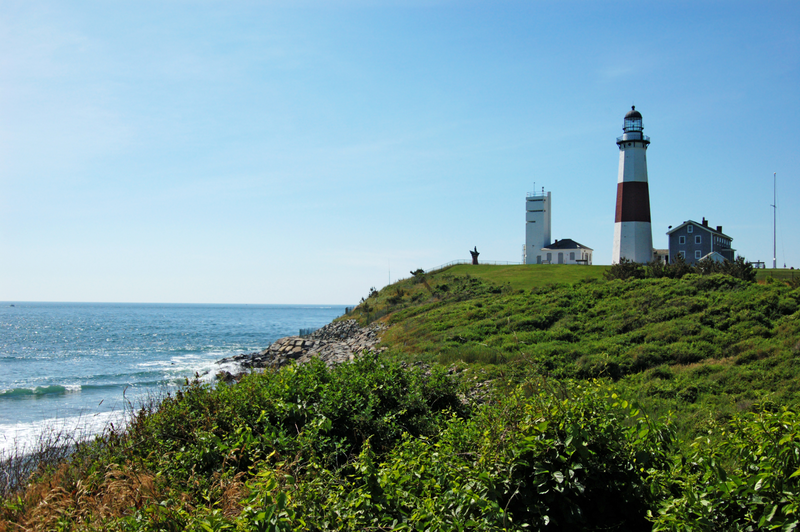 Our next stop will be Long Island’s eastern most point where the majestic Montauk Point Lighthouse stands tall and proud. In 1792, President George Washington signed an order to have the Montauk Point Lighthouse built and it is now the oldest operating lighthouse in New York State and the fourth oldest in the country. Lighthouses have always played a significant role on Long Island. They have been the guardians of our waters for hundreds of years and now you will have the opportunity to experience one of the country’s most famous lighthouses firsthand. A visit to Montauk would not be complete without a stop at Gosman’s Dock. This is a combination of a working fishing port and a shopping area. You will have time to visit the shops and also will have “free time” to enjoy lunch on your own at this waterfront center. Tour Sag Harbor. Sag Harbor was one of the main ports of entry into the U.S. It has a fascinating history of whaling and is still to this day, one of Long Island’s most popular maritime villages. During your tour, you will see the town’s centuries-old streets lined with ancient trees and inviting homes along with the many antique shops and boutiques that line the village’s Main Street. Your tour will include a stop at the Sag Harbor Whaling Museum and the Old Whaler’s Church. Enjoy some free time within Sag Harbor and enjoy the sights and sounds of this old maritime village. You will have an opportunity to visit a variety of local shops including the local five & dime. Stop by one of the local attractions such as the Old Custom House or spend some time down by the water’s edge on the town dock. Return to the hotel, relax and enjoy the amenities the inn offers before your departure for dinner. Dinner tonight will be offered at Jerry and the Mermaid, in Riverhead. It is one of our favorites and can also be one of yours. It is an establishment that offers an original Long Island experience in a casual atmosphere. It is sure to be enjoyed by all. Next you will visit an unusual presentation of wine, food, and horses. During the 1980’s, Sam Rubin, founder, ventured to eastern Long Island and acquired what has since become the beautiful Baiting Hollow Farm Vineyard. Sam, a lifelong farmer and naturalist, began to till the soil, the basis for all great wines, using only organic compost and other natural ingredients. This approach, the acquisition of fine French vines, the rather hospitable climate of the region, along with his vision and hard work, remain the foundation for the vineyard’s rather exceptional wine. You’ll be introduced to their wines and taste them along with your buffet lunch while a question & answer period takes place. Enjoy a brief private walking tour of the vineyard, which includes visiting with the horses that have been rescued. Here, among the warm atmosphere and bucolic setting lies a horse haven unlike any other on Long Island. Horses whose lives were at risk have, through love and dedication, been given a second chance. Here, they not only find sanctuary, but are given the opportunity to become ambassadors, helping to educate the public about the need for legislation to protect horses. At the conclusion of the tour, you’ll return to the Tasting House where you may visit the gift shop, prior to departing.